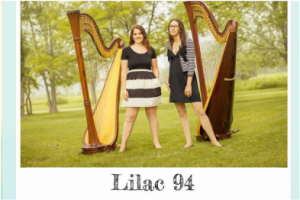 There are 94 strings on two harps — and that’s where Lilac 94 got their name. Kathryn Sloat and Christina Brier of Lilac 94 Harp Duo traveled from the East Coast to Chicago to share a program of contemporary music, including pieces written by famous harpists as well as up-and-coming composers. Lilac 94 is dedicated to performing new and previously undiscovered music and exploring creative ways of using the harp. Lilac 94 performed on Saturday, January 17th at 10:00 AM, over coffee and cookies, at Church of Beethoven – Oak Park. The concert featured music from their tour of the Midwest last summer which was a set of new works written for them recently by Daniel Morel and Bret Bohman. Each of the pieces portrayed a different setting in the Midwest, including Kansas City, Tiffin, Ohio, and Ann Arbor, Michigan. Christina and Kate thought it would be interesting to play Bret and Daniel’s music in their places of origin, and fun for audiences in the Midwest to hear their area of the country depicted as harp music.